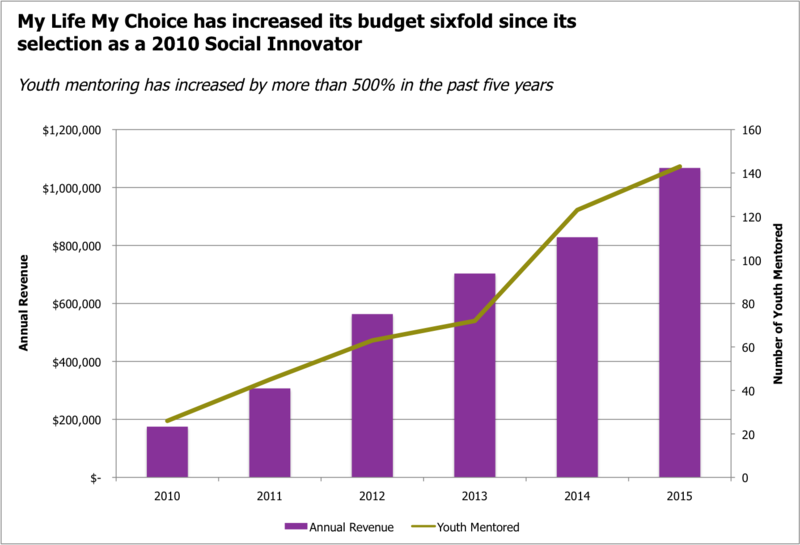 When My Life My Choice (MLMC) was selected for the 2010 Social Innovator cohort, the commercial sexual exploitation of adolescents was an issue with little visibility and even less funding in the local community. The seven-year-old organization, which had developed an effective model for addressing the issue, served around 125 girls each year but faced significant financial and organizational challenges. My Life My Choice had no advisory board and the director was struggling to pay the staff. In addition, because the organization was focused on short-term financial stability, it had no structured plan in place for the future. Founder and Director Lisa Goldblatt Grace knew she had to turn the organization around. Since that time, our budget has grown sixfold to more than $1 million and our staff has increased from three to 17. My Life My Choice worked with its SIF consultant to shape a plan for long-term sustainability by looking to diversify revenue streams. Together, they created a clear articulation of the organization’s message and vision for impact and created materials designed to engage potential supporters in the organization’s future. Then Lisa delivered a compelling pitch to an audience of more than 300 people at the 2010 Social Innovator Showcase. Participating in the SIF community gave My Life My Choice access to a new network of funders and potential supporters who were eager to learn about the organization’s approach to this critical, yet challenging, issue. Shortly after the Showcase, an individual in SIF’s network made a $100,000 commitment to the organization. He later joined MLMC’s newly developed board. Other funding opportunities followed quickly, including a $50,000 gift from the Polaroid Foundation. My Life My Choice’s board helped it create a new revenue stream by expanding its training and technical assistance work. Additionally, in 2012 the organization worked with a production company on a public service announcement (PSA) raising awareness of the commercial sexual exploitation of children. The spot won a New England Emmy Award for Best PSA and ran throughout the year on WCVB. Through the SIF process, Lisa further developed and strengthened her leadership skills, enabling her to lead the organization through a period of remarkable growth. Along with Associate Director, Audrey Morrissey, a survivor and strong voice on this issue, MLMC’s budget grew three-fold in the three years after the SIF engagement, surpassing its financial goals. "Working with SIF made an enormous impact on the growth and sustainability of My Life My Choice," said Program Director Lisa Goldblatt Grace. "We were named a Social Innovator at a time when our organization was at a real inflection point. Since that time, our budget has grown sixfold to more than $1 million and our staff has increased from three to 17. We are immensely grateful to SIF." In addition to its local work, My Life My Choice is a national leader in the movement to end commercial sexual exploitation of children. New York Times columnist Nicholas Kristoff and his wife journalist Sheryl Wu Dunn featured the organization in their 2015 PBS documentary A Path Appears, highlighting its unique and groundbreaking work.